Unlike an ordinary C# class, a controller is dealing with HTTP protocol. And HTTP doesn't understand overloading as C# does. So, in case you wish to use method overloading in a controller you need to consider the four possible ways as discussed in the remainder of this article. As you can see the first Index() action deals with the GET requests whereas the second Index() action deals with POST requests. The first version is parameter-less whereas the second accepts a parameter of type Customer (this depends on what you are submitting from the view. The above example assumes you are submitting customer data). The above overloaded methods work fine since each is dealing with different HTTP verb. Now in this case there are two DoWork() actions but one has an integer parameter whereas the other has a boolean parameter. Moreover, [Route] attribute is used to configure attribute based routing. Notice that the first [Route] attribute specifies that status parameter is int and the second specifies that it is bool. So, if a URL is /home/dowork/10 then it will be handled by the first DoWork() whereas if the URL is /home/dowork/true it will be handled by the second DoWork() action. Make sure you call MapMvcAttributeRoutes() in the RouteConfig.cs file before you test this technique. 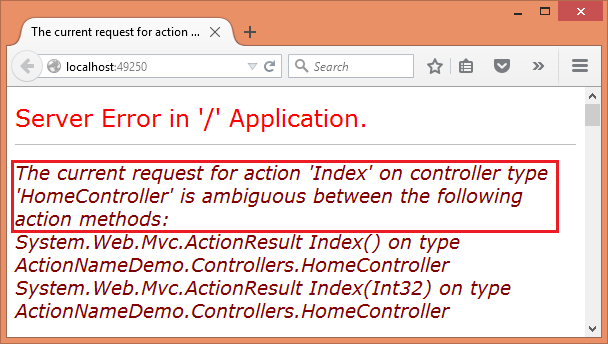 Here, the first method - Calculate() - acts as an MCV action method. The Calculate() then invokes an overload - Calculate(int,int). The overload does its job and returns a view to the caller. Notice that the second Calculate() is marked with [NonAction] attribute. The [NonAction] attribute indicates that the method under consideration should not be treated as an action. Since the method is no longer an action it doesn't interfere in the working of HTTP and the controller. Here, we have two overloads of the ProcessForm() actions. However, both have [ActionName] attribute added on top of them. The [ActionName] attribute assigns a unique name to a method that is then used by the MVC framework. That means for your C# code the method name remains ProcessForm() but for the MVC framework (including routing engine and HTML helpers) they represent two methods - ProcessForm1() and ProcessForm2(). Remember that when you use [ActionName] attribute you are assigning a different name to the action method under consideration. In helpers such as BeginForm() and ActionLink() you should use the name as defined in the [ActionName] attribute (ProcessForm1 and ProcessForm2 in this case). That's it! Although it is better to keep away from method overloading in the controllers, if at all you wish to implement overloading you can use one of the above ways. As you can see using overloading adds a bit of complexity to your controller. But it is possible in a limited way if needed.